You use a travel agent to book flights, hotels and autos. Now you can book technology like you book your hotel with a Tech Travel Agent©. Technology including laptops, computers, plasma flat screens, lcd projectors, printers, wireless internet access, sound systems, staging, lighting and more! 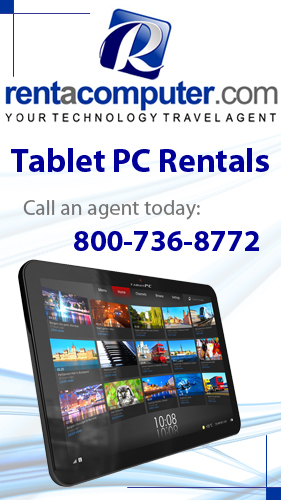 A Tech Travel Agent© is your personal technology procurement agent, nationwide, worldwide. Wherever you travel, you can be assured that the technology you need will be installed and operating as planned with only 1 point of contact… your Tech Travel Agent©. Call Toll Free 877-422-1907 or visit our Technology Quote Request Page. A Tech Travel Agent© does. They take care of the logistics of any temporary or permanent technology installation. After ensuring an on-time delivery and setup, the job’s not done. Your Tech Travel Agent© will be your point of contact for any service need you have. If there is an equipment failure or malfunction, your Tech Travel Agent will be your single point of contact to quickly manage a solution.